Often I am asked how the naming of Rattlesnake Island came about when I am transporting island buyers around to various properties. Yes it is true that there were rattlesnakes on the island although it has been many decades since anyone has confirmed seeing one on the island. How the snakes got there is a mystery, although the ledges was an ideal habitat for them. One of the stories on how the snakes got there is the Indians wanted to protect some of their possessions from the white man when he entered the area. The Indians transported their possessions to Rattlesnake and then set the snakes loose to keep the white man off the island. Another story is that two brothers lived on the island. They had a falling out in which one brother built a stone wall down the island to split it in two and then in an effort to drive the other brother off his side of the island he set the snakes loose. This, according to the legend, was a great failure as both brothers were driven off the island when the snakes multiplied rapidly. Libby Museum in Tuftonboro has some of the island snakes stuffed for the public to see therefore documenting the history. In the early 1900’s there was a gentleman by the name of Jesse Whitten from Wolfeboro who considered himself a healer of sorts. He would harvest the snake tails from the island to use in his healing potions. There are also reports of workers from the lumbering operations who got bitten by the snakes. To try to eliminate the snakes the island a fire was set but the snakes were able to hide deep in the crevices in the ledges and survived. The island was finally eliminated of the snakes by the introduction of razorback hogs which in turn killed the snakes. Some people believe the island is named as such due to its shape and some believe it looks like an alligator. Whichever way you think Rattlesnake is an island with a lot to offer. It is actually part of the Belknap Range and the peak of the island is 900’ in elevation, which is 400’ above mean lake level and 886’ lower than Mount Major. The panoramic views from atop the island are spectacular. There are many hiking trails on the island and great bonanzas of blueberries and raspberries. However there is no public access to the island so unless you own on the island, or know an owner, there is no way to hike it. The island is 2 miles long and approximately 5 miles in circumference. In the late 1950’s, early 60’s, there was a measured mile on the northeast side of the island so boaters could measure their boat speed. 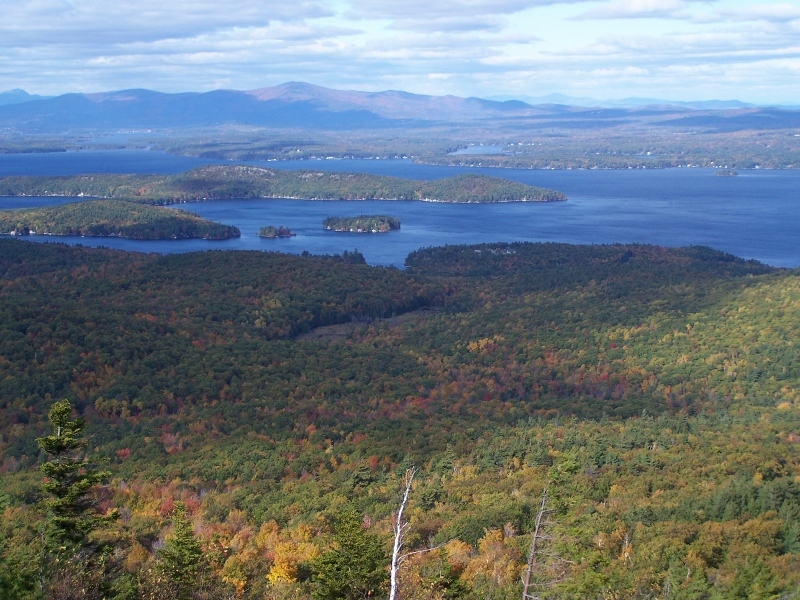 It is the third largest non-bridged island on Lake Winnipesaukee with 368 acres. It certainly is the tallest and easiest to recognize, a great landmark to help boaters orientate themselves on the Lake. Are you interested in purchasing a property on Rattlesnake Island in New Hampshire? View currently listed homes on Rattlesnake Island or start your search here. You can also contact Nancy if you have questions or would like help with finding the right home.